Twice Grammy Award-nominated vocal group Seraphic Fire and the string ensemble Spektral Quartet collaborate in a Good Friday performance of Haydn’s “Seven Last Words of Christ,” a Lenten work offering choral/instrumental treatments to each of the seven last utterances of Jesus on the cross, in a Lawrence University Artist Series concert April 18 in the Lawrence Memorial Chapel. Tickets, at $22-24 for adults, $20-22 for seniors and $17-19 for students, are available at the Lawrence Box Office, 920-832-6749. One of America’s leading vocal ensembles, Miami’s Seraphic Fire is best known for repertoire ranging from Gregorian chant to newly commissioned works and has produced a discography that includes 10 recordings. In 2012, Seraphic Fire received Grammy Award nominations for Best Choral Performance for its rendition of Brahms’ “Ein Deutsches Requiem,” which debuted at no. 7 on Billboard Magazine’s Classical Charts, and Best Small Ensemble Performance for “A Seraphic Fire Christmas,” which NPR hailed as “just fabulous” in a review. Seraphic Fire was the only choir in North or South America to be nominated for a Grammy Award in 2012. It also was also the sole classical ensemble to be nominated for two separate projects. The Chicago-based Spektral Quartet has been praised for “leading the charge toward progressive, high-caliber contemporary classical music” by The Chicago Reader. The group’s performances focus on eliminating the divide between classical masterworks and present-day compositions, staging intimate concerts with carefully curated set lists emphasizing the “conversational” potential contemporary and classical pairings. 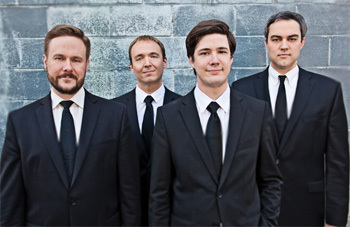 The quartet holds an artist-in-residency at the University of Chicago and often undertakes unique musical projects. For its “Mobile Miniatures” initiative, the quartet commissioned 40 composers to write ringtone-length pieces of music for use on mobile devices. “If ever there was a combination of ensembles that could provide the very highest of musical refinement and offer it in a new and impactful way, this is that,” said Sieck.